When you carry small objects, like a book or a bag of groceries, you probably don't notice too much strain. It's easy to carry small things around without breaking a sweat. However, when the weight of the object increases, the act of carrying becomes more difficult. Carrying a engine or gearbox, for example, is much harder than carrying a book. Your body will need to work harder and expend more energy to carry the extra weight, and chances are you'll sweat a little in the process. The same principles apply to our cars or van. When they're only carrying the driver, cars run easier and use less fuel. If you've packed up your car with every item from your holiday, you might notice the vehicle moving a little slower, and your fuel mileage would certainly decrease. Sometimes the transmission fluid just isn't enough to keep everything cool. There are times when the fluid temperature can exceed the maximum range of 160 to 200 degrees. When this happens the fluid begins to burn. This decreases the amount of fluid running through your transmission, which in turn can seriously damage all of the important moving parts within the transmission. Installing a transmission cooler is an extra precaution against overheating your transmission, and many people decide to use them in tow vehicles. Transmission coolers come in many different shapes and sizes, pulling a heavy load up a steep grade can generate a lot of heat in an engine and transmission. Will the transmission cooler be able to cool it down? There's actually quite a bit more to consider than that, but at least now you're thinking of some of the variables that you need to consider when you're choosing a transmission cooler. 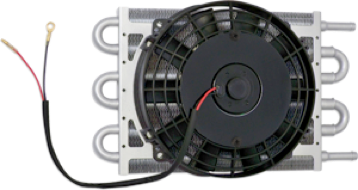 Why do you need an Automatic Transmission Cooler? Today's engines have been downsized for economy and must therefore work harder than before. An automatic transmission cooler can help get rid of the extra heat generated. Each year 13 million transmissions fail...90% of those are due to overheating! By fitting a cooler you will dramatically enhance the life expectancy of your car's transmission.